While focusing on a section of AfuriKo’s recent arrangement of “Kassai” during practice yesterday, I came across a mi7(b5) chord that calls for the locrian chord scale. Remembering Frank Mantooth’s approach in his Voicings for Jazz Keyboard inspired me to research possible 5-note 2-hand voicings for this chord. sound best in the context of a minor II-V-I. 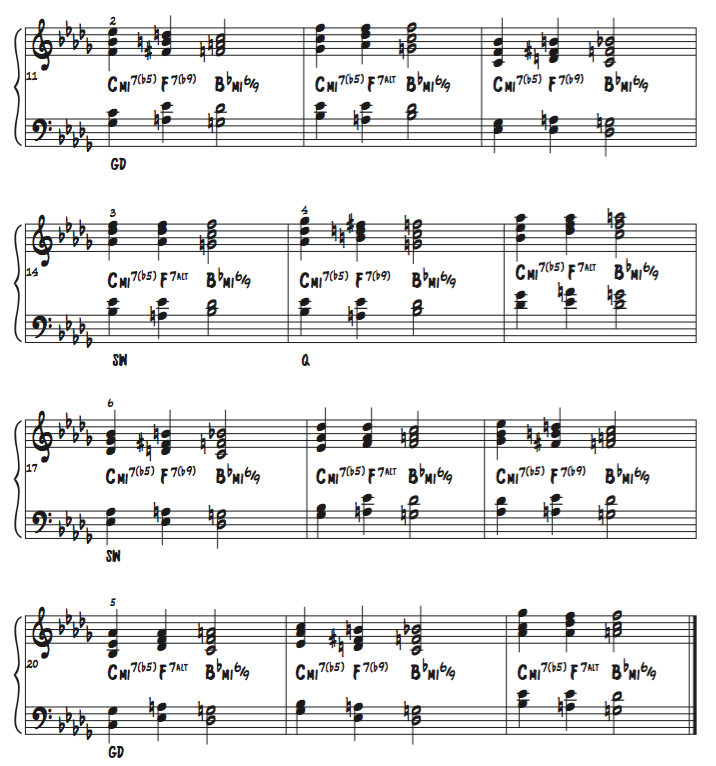 You’ll notice that most of the eligible voicings include all three guide tones (namely b3, b5, and b7), which seems coherent since these notes characterize the mi7(b5) sound. One of the voicings, however, features b3 and b7 only (no b5), but still sounds strong as a mi7(b5) chord (to my ears…) so I went ahead and included it here, too. Incidentally (or not! ), these notes make up the F insen pentatonic (F Gb Bb C Eb), which reveals itself as a very interesting scale to solo over Cmi7(b5). Now, it turns out this particular set of notes corresponds to the Db major/Bb minor pentatonic, which is thus also a valid choice to solo over Cmi7(b5). This last set of notes uncovers the Gb major/Eb minor pentatonic, yet another option to solo over Cmi7(b5).